A tradition that never gets old if you’re involved with The Ohio State University is beating Michigan in anything whether it’s lacrosse, checkers or a having a Netflix binge watching competition (I don’t know how that would work). In any event, the Buckeyes made it a perfect 4-0 record against their rival on Sunday, beating them 13-8 at the Big House in Ann Arbor, Mich. So let’s breakdown Sunday’s game against the Wolverines as well as take a peek at the biggest week of the season for the Scarlet and Gray as they will take on No.3 Maryland in front of what is expected to be 40,000 fans by game’s end on Saturday. That the Buckeyes were down 3-2 at the end of the first quarter. Last year against the Maize and Blue at The Shoe, OSU was also down 3-2 after the first, and the two teams were tied 6-6 at the half. 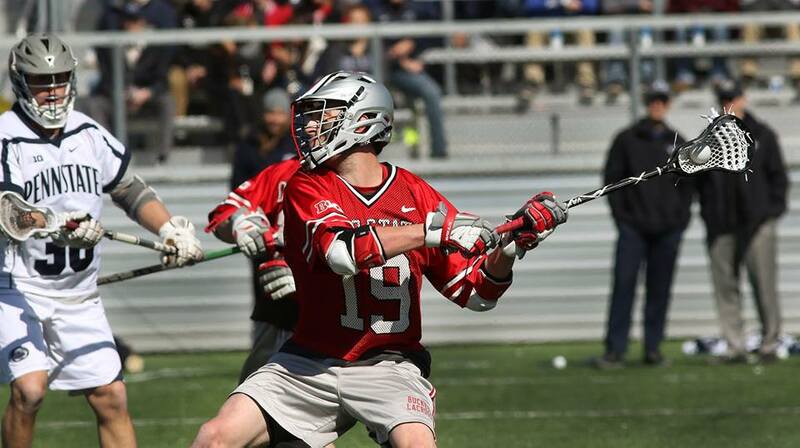 OSU ended up scoring nine unanswered goals to win that contest 15-6. That’s just what happens in rivalry games. You toss records aside because the games can get emotional and Michigan came out strong and ready to play. Scored one goal on 10 shots. Heck, toss in sophomore Mikie Schlosser who had one goal on seven shots. The reason for that? Not only another stellar display of Buckeye defense, but Tom Carey has established himself as one of the finer goaltenders in the nation. His footskills were great, positioning was top notch and his reflexes were once again on point as he made 11 saves on the afternoon. His performance earned him Big Ten Specialist of the Week for the second time this season. Because OSU’s depth came to fruition on Sunday on the offensive end. If guys like Carter Brown, Colin Chell, Ryan Hunter and David Planning are on their games (which they were), the Buckeyes are a very dangerous team from top to bottom. For freshman Colin Chell. The Boys Latin product scored three goals on three shots and added two assists in the win. His efforts earned him his second Big Ten co-freshman of the week award. His three goals were the most among all players on Sunday. Was the Scarlet and Gray’s five unanswered goals in the second quarter, capped off by JT Blubaugh’s goal with nine second left in the half to put OSU up 7-4. In many cases this season, the Buckeyes have taken one quarter per game, and just loaded up on other teams. Head coach Nick Myers had stressed time and time again how he wants a full 60 minute effort from his team. They will need exactly that and maybe then some on Saturday against Maryland. #11 Ohio State vs #3 Maryland @ Ohio Stadium. Saturday at 11 a.m.
That Nick Myers and his program could want. Ohio State. Maryland. Big Ten regular season championship on the line. NCAA Tournament implications at stake for OSU. 40,000 expected in the stands near the tail end of the game due to the football spring game taking place after. This is a must watch game if you have access to it. If Ohio State doesn’t play a full 60 minutes, they will lose. Book it. Take it to Vegas. Collect your check. Cash it in at the bank. When the Buckeyes play 60 minutes of lacrosse, as I saw first-hand against Johns Hopkins, a 15-12 win, they can hang with anybody. They play a Maryland team that has won 10 in a row and are number one in the nation in defense, giving up five and a half goals per game. By the way. As great as the Buckeye defense is, ranked ninth in the country giving up just under eight goals per game, this will be a chess match for the ages. This is where the depth of the Scarlet and Gray will be the key. If they rely on Jesse King to take over the game, they’ll probably lose. I say this because while I’ve had the honor of watching this man play for two years, and I know his skills warrant “game changer” ability, I’m under the firm belief that Maryland head coach John Tillman is too good and too experienced to let that happen. Because they’ve won their last two games by one goal. While Loyola is a quality win, Rutgers took them to the brink, as Matt Rambo’s goal with 13 second left gave them the 9-8 win. The Scarlet Knights even held a 6-3 lead midway through the third quarter before the Terps woke up. Because good teams always find a way to win. That’s what Maryland is. You don’t win 10 in a row and find ways to squeak out wins like that unless you have something special going on. This has the potential to be one of the games of the year. I say “one of” because let’s be honest, nothing will really top that Notre Dame/Syracuse game in South Bend. OSU’s defense against Maryland’s. King, Carter Brown and David Planning for the Buckeyes against Rambo, Jay Carlson and Joe LoCascio for the Terps. Tom Carey and Kyle Bernlohr guarding each teams nets. This will be fun. Who doesn’t love the idea of tens of thousands watching a lacrosse game?